Whether you are looking for a traditional premise based system or a cloud-based hosted system, we have you covered. Intechtel systems come with full technical support, and a feature rich web interface for making changes internally with no need for a service call or wait. Intechtel phone systems also work with a wide variety of handsets that operate using the SIP standards protocol. This means that you can choose the phones that best make sense for your business needs instead of being forced into one particular model and style. Every Intechtel phone system also comes with on-site training for your staff during launch day/week, and unlimited phone/remote tech support for life! We will also work directly with carriers when number porting is involved, to ensure a smooth transition. All of this is included at no additional cost. Hosted PBX or VoIP phone systems are cloud-based, while on premise phone systems are independent phone systems with servers and hardware on site. Each type of system has pros and cons. 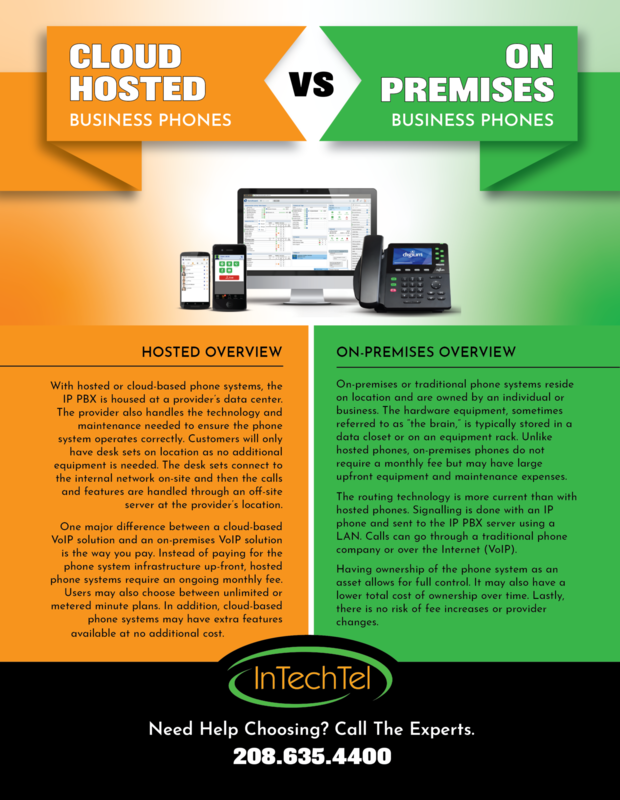 Read below to learn more about hosted vs on premises phone systems. Equipment is maintained at off-site data center and is cloud-based. The phone systems connect to data center over the Internet connection. Equipment is kept on-site. Premises phone systems are connected locally to the on-site server. No control over your system. The provider has actual control of the phone system. All maintenance, updates, fixes and support must be handled internally or hired out by the company. Total flexibility – Phone system owners can do as they wish with their equipment. Changes can be expensive. Some companies may not have the IT or financial resources to make major changes. Training will be required for users. Training may or may not be offered by providers. Any business that wants a lower initial start-up cost and quick implementation. This may be an appealing option for small businesses or start-ups businesses. Businesses or enterprises with the available IT budget to afford the initial set-up cost and have a need for more control and flexibility. Or, businesses that don’t want to be locked into a monthly fee for the duration of the phone system’s use. Incredible experience. Just relocated my software engineering company to the area and Intechtel was an amazing resource to us for all of our networking and communication needs… They care, they take pride and they can be trusted. I love our new system. The customer service is top notch. I had a lot of questions and they were friendly and patient through all of them. Top notch Company! Adam and his employees were on time, very friendly, and did everything we asked them to do. I would recommend Intechtel to anyone! Looking a phone service plan? We offer traditional, VoIP and Cloud based service plans.